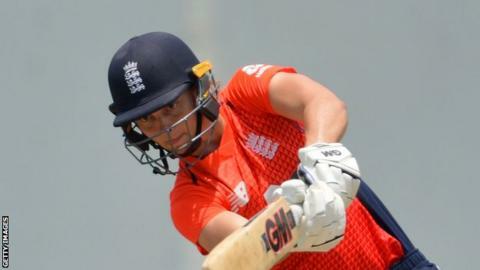 England thrashed Sri Lanka by eight wickets to take an unassailable 2-0 lead in their Twenty20 series. Sri Lanka could only manage 108-6 in their 20 overs, with Katherine Brunt taking 2-31 for England in Colombo. England got off to a strong start with openers Danni Wyatt and Amy Jones putting on 79 for the first wicket. Tammy Beaumont and Natalie Sciver then saw England home in 13.5 overs for a ninth successive win on their tour of India and Sri Lanka. England lost the one-day series against India 2-1 but England claimed the last match of that contest and have not been beaten since. They whitewashed India 3-0 in a T20 series and then won the ODI series over Sri Lanka by the same margin. The third and final match of T20 series against Sri Lanka takes place on Thursday. We've been here before... England restricting Sri Lanka to a below-par total and chasing their target down with the minimum of fuss. Perhaps the biggest difference was the new opening partnership: Amy Jones and Danni Wyatt looked in fine form at the top of the order with 79 for the first wicket, and a class above anything the hosts could offer. This T20 series has gone almost perfectly for Mark Robinson and his side, the only hope will be that they can get the chance to bat first in the final T20 and really flex their muscles. As I looked through the local paper before the game, there were no references to this series - the lack of publicity, interest and the performances on the pitch all suggesting the women's game in Sri Lanka has some way to go.